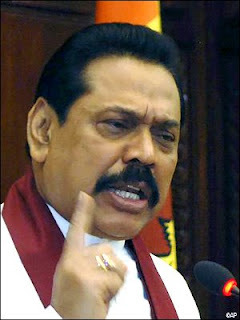 Colombo (PTI) President Mahinda Rajapaksa has said he is prepared to face any court to defend Sri Lankan military commanders on charges of human rights violations during the recently concluded war with the LTTE. "The President emphatically stated that he was prepared to appear before any Court on behalf of the Military leaders," an official release said. Mr. Rajapaksa was addressing a election rally in the Central Sri Lankan Uva province on Tuesday. Certain powers who killed all young men above 18 years following the great rebellion in Uva Wellassa in Sri Lanka are ridiculously trying to teach us human rights today, Mr. Rajapaksa said. He said they were targetting Sri Lanka for alleged violations of human rights today to cover up their own sins in these massacres of the past. He said that today, to protect the same country which was rescued by the modern heroes of the county`s armed forces, every citizen will have to put in a certain amount of hard work. The President said his government would reconstruct the great irrigation works in Uva Wellassa region.